I’d never heard of the Big Leg Break being described as something different to your bog standard Leg Break until I read Peter Philpotts book. I thought a Leg Break was a Leg Break and when it turned big it was either - you putting more effort into it or you getting lucky and the ball turning out of some rough! I didn’t realize that there was a technique to it, but there most definitely is and if you haven’t read the book the art of wrist spin bowling you may find this contentious or simply physically impossible. The characteristics of the biggun are all pretty much as you’d expect of the Leg Break, but it just turns more – a lot more! This comes about through the application of Philpotts round the loop theory whereby the position of the wrist dictates the direction of the spin and therefore the direction of the deviation from the expected line of delivery. The top spinner with it’s over-spin - spins forward because the wrist flicks forwards with the thumb leading the way. The batsman sees the hand with the thumb at the front and the side of the hand visible. Hold your hand out in front of your with your thumb facing your nose that’s the aspect that he sees. Now turn your hand 45 degrees anti clockwise between the Top-Spinner position to one where your thumb is pointing to your right and the face of the hand is facing you. This is the leg break position and any variation between those 45 degrees potentially offers you varying degrees of sideways deviation off the line of flight because of the sideway rotation. Needless to say the palm facing you with a big flick would mean that the ball would come down the wicket to you as the batsman with seam rotating sideway and only the smooth side of the ball visible, so once it hits the track it’s only going to go one way – sideways. So have you realized what’s coming next? In order that the ball spins even more radically to create even more deviation off its flight line once it hits the track, you apply the around the loop theory. 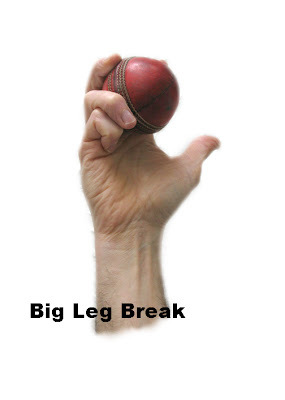 From the Leg Break position of the hand facing you - now turn your hand further still anti-clockwise so that side of the hand with little finger (The karate chop side) comes round to start to be in front of your face – this is now the side of the hand that should be facing the batsman during the delivery of the Big Leg Break (see image) or put in another way if your were throwing a spear forwards it’s that side of the hand that goes forward that faces the bat in this delivery. In addition you then give it the big flick. If you’re keeping up with this you’ll be sitting there thinking but that suggests that I spin it backwards? Exactly! The ball spins inwards with the seam spinning towards somewhere between Square Leg and Fine Leg. In the book Philpott alludes to this early on, suggesting that as well as spinning/flicking the ball from your right hand to left hand with the seam sideways to you, also hold the ball at arms length with the seam straight on to you and spin it back in towards your body. So right from the start he’s suggesting that you learn the back spin technique as well as the conventional side to side technique when you're just standing around learning how to flick the ball and get the rotation going with the use of the wrist. It’s this that produces the Big Leg Break. The ball lands and has diagonal backspin towards the off-side. The forward motion is suddenly interrupted by the contact with the surface in the same way that the Flipper is but the diagonal nature of the seam angle means that the forward energy is combined with the diagonal backward forces and the result is the big turning Leg Break. I think I’ve said before that lots of people do have the ability to pick up a cricket ball and simply using common sense and agility can bowl leg break balls using all sorts of variations of the 2 up 2 down grip and sometimes other more unorthodox grips. When I first discussed this technique (Big Legbreak) on website forums it was met with derision by some people and I personally couldn’t do it across 22 yards always instead producing a Googly/Wrong Un ( Googly syndrome ). But I did have an hour once practicing with a mate throwing the ball back and forth and I got it and was able just for that hour to produce massive turning Leg Breaks. Other people on the forum that tried it have developed it and now report that their little leg Break is now a big Leg Break simply by using Philpotts back-spinning into the body technique. If you try this standing up at arms length and bowl it over short distances it’s relatively easy to replicate with the big flick and back-spin and you’ll see how the forward motion is interrupted on impact and the ball spins away to the left (Off-side) massively as a result of the seams position and the back-spin. If you have any doubts with regards the validity of this as a technique I can only point you in the direction of Peter Philpotts book The Art of Wrist Spin Bowling. Yeah flick the ball in towards your face using the leg break finger and wrist action with your arm stretched out in front of you. If you let the ball drop to the ground it'll jump towards you because you're putting back-spin on it. Do that again and again all the time (I use plastic hockey balls on concrete) until you get a really good flick and spin on the ball and the action is smooth. Then take it to the stage where you bowl it over a distance. Initially it may only be a short distance, but build up the distance. What you aim to do is bring the arm over and then flick the ball back towards yourself using your wrist. The flick combined with the bowling action will mean the ball will leave your hand spinning with the seam 90 degrees to the direction of flight. Loads of people have difficulty understaning this and you're probably best off reading Philpotts book as well. It's not easy - but then bowling Wrist spin isn't easy. I put hours and hours into learning this stuff and it will come together for you if you keep at it. For support you should sign up to www.bigcricket.com and post questions on my Wrist Spin thread which I think is probably the most active wrist spin thread on the internet. There's several blokes on there that'll answer your questions and a few that'll testify to this working having been sceptics themselves initially. This is something I'm working on getting some video footage shot of and upload it to youtube. Once that's done I'll put a link to it in the blog, so check back over the next couple of months. Matt, with regards the video footage, this isn't going to happen in the short term as I was hoping I'd be able to access a camera via work. But the order for the cameras has been put on hold and I'm not looking at ordering one now till possibly next spring if they don't get them at work. If you look on youtube though my mate Jim has got some exceptionally good slo-mo vids of his bowling that you may find useful.